In our home, dinner for two can become dinner for six in an instant. A friend might be in town or a neighbor might knock on the door, and 9 out of 10 times, I can think on my feet and change the menu to fit the number of guests we have. The last minute change of direction fuels my culinary creativity. I love it. When a quiet dinner for my wife and I became dinner for six, I needed to work out what to do with the two lamb chops I had treated us to. It was just hours before the Sabbath began (once the Sabbath begins at sundown on Friday, there's no cooking or grocery shopping for 25 hours. It's bliss, but you need to be ready for it) and I was really working with what I had in the kitchen. There was one other reason that I was excited to change our menu at such short notice. On the way home from work, I stopped at Macy's to buy a basket for our mother's day picnic. I picked up a set of four appetizer spoons, almost identical to the ones they used on the TV show "The Taste" . I've never made amuse bouche before but the stars had aligned this week and this was clearly meant to be. 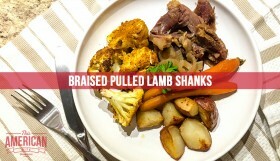 Taking a quick look online, I found inspiration in the form of Pan-Seared Lamb Chops from Alexandra's Kitchen, but I wanted to give this my own twist… In my mind I was cooking for chef's Malarkey, Lawson, Ludo and Bourdain and I wanted to impress. 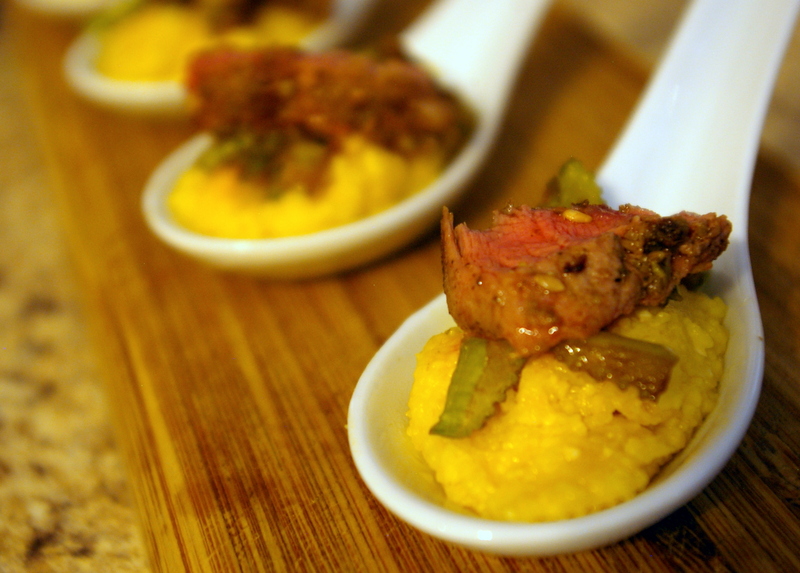 I figured creamy polenta would compliment the lamb nicely, and some finely chopped celery for texture. Adapting my lamb stock polenta I went with a non-dairy milk for the liquid, and skipped the final stages where I grill the polenta. The creamy polenta became a bed for the lamb. 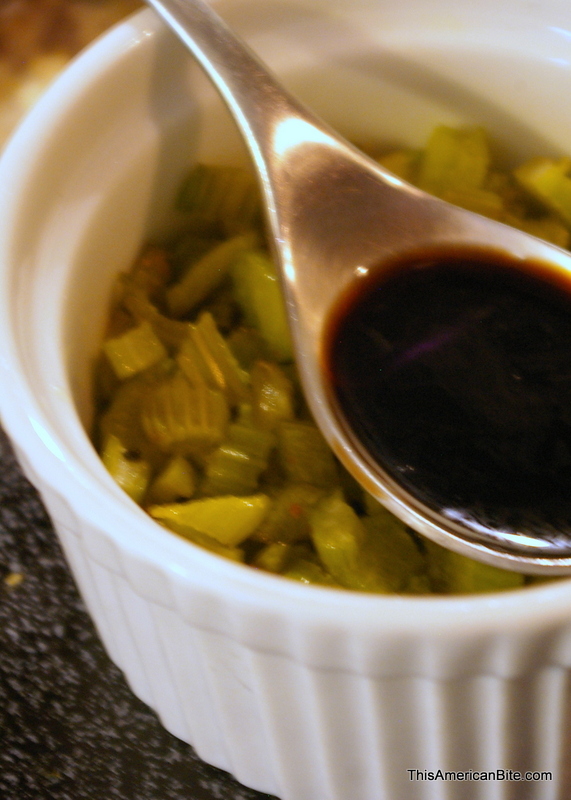 I sauteed the celery and as it cooled I added a teaspoon of my homemade balsamic (style) vinegar. Now on to the lamb. What better signature to this dish than a crust of dukkah and zaatar? Time was of the essence so I covered the lamb chop with the dukkah–zaatar blend and started to warm my skillet while the lamb sat for a few moments. This is really where I turned to Alexandra's pan seared lamb recipe to make sure I cooked this perfectly. Overcooking this would kill the entire dish. Just one minute on each side was all this lamb needed. Once the lamb was cooked I wanted to be sure it sat for five or six minutes before I removed it from the cutting board. Letting the lamb sit for a few minutes is key to letting all those juices reabsorb into the meat. I sliced the lamb into bite-size pieces before plating, each of these spoons got just a taste, and the flavors came alive. The dish was a success, and two lamb chops was enough for eight to twelve portions. Be sure to cut around the fat, you don't want to serve that on a bed of polenta! 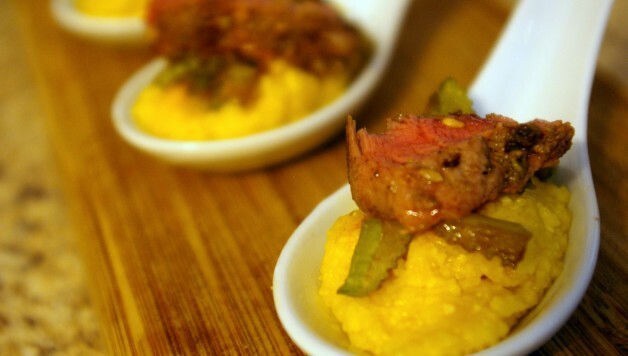 Turn two lamb chops into 12 appetizers with these taste size bites of lamb, served with creamy polenta and balsamic marinated celery. Start by making the creamy polenta. Heat the water and milk in a pan. Once the liquid starts to boil, slowly pour the grain into the liquid, whisking the polenta gently while you pour. Continue to stir gently for three to five minutes then remove the from the heat. If you think it needs to be a little creamier, slowly add more non-dairy milk and stir. Setting the polenta aside, move on to the celery. Sautee in olive oil until soft, about six minutes. 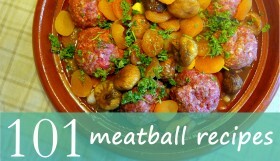 Remove from the heat and pour one teaspoon of balsamic vinegar over them while they cool. 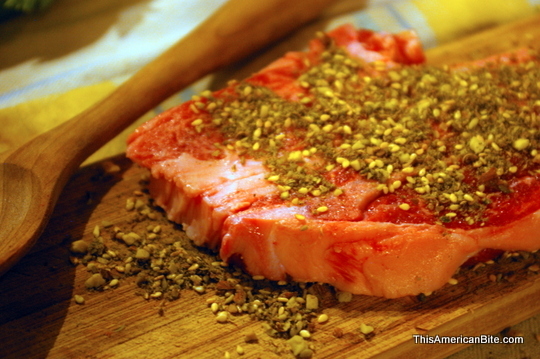 Now the lamb… combine the dukkah and zaatar and sprinkle evenly over the lamb. Heat a griddle pan and drizzle a little olive oil in it. It should be slightly smokey. Place the cops in the pan, and keep watch for one-two minutes. Flip them and cook for one-two more minutes. 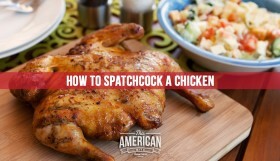 They might look rare but as long as your meat thermometer reads 145 degrees, they are safe to eat. 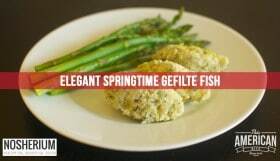 Remove from the pan and allow them to sit and absorb the juices for at least five minutes… resist the urge cut off that "ugly corner" and taste-test! 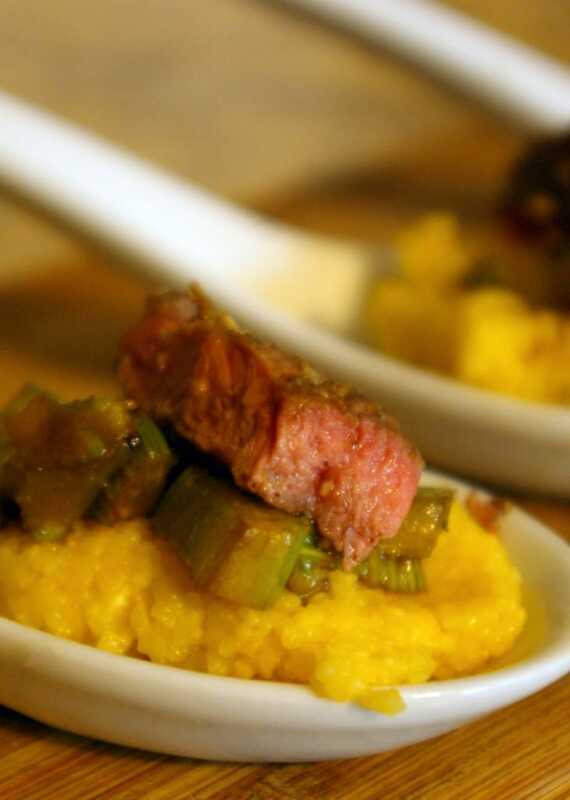 Start to assemble your spoons with a teaspoon of creamy polenta, two or three pieces of celery, and a bite size slice of lamb. We enjoyed our meal with a bottle of Binyamina Reserve Merlot from my Jwines Israeli Wine Club. A great dinner calls for a great bottle and the pairing of the lamb and although I usually prefer a Cab (which is also a great compliment to the enormous flavor of lamb chops), this Merlot was the better choice. There's an earthiness and acidity to this bottle which compliments the lamb and is calmed by the creaminess of the polenta. All in all, this was the perfect opening to our meal that also featured a Moroccan chicken dish.